Musrara Mix Festival 2019 dates and events will be updated as they become available. Meanwhile, you can check out last year’s events. Musrara Mix is an international interdisciplinary art festival that takes place annually in Musrara, the Jerusalem neighborhood on the seam between eastern and western Jerusalem. During this three day festival, dozens of Israeli and international artists and musicians, and students of the Naggar School exhibit their works, and perform for audiences, including dance, music and alternative performances. There are also lectures and workshops available. 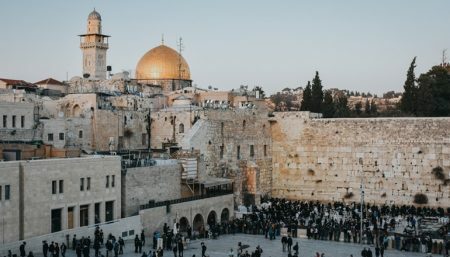 This hub of art and social happenings depict the cultural and political sides of Jerusalem specifically and Israel in general. The festival is initiated and produced by the Naggar School of Art in Musrara with cooperation from the neighborhood residents. The residents participate in the production, donating electric infrastructure, support and enjoying the large crowds that come to the neighborhood. Musrara Mix is an expression of the school’s belief that the artistic process serves the important function of drawing attention to our society and the identities of which it is comprised, and its belief that the festival is an influential part of the educational process for students of the school. The general public is invited to these evenings that are free of charge (besides the shows taking place on the central stage) in order to experience the Musrara neighborhood, wandering the streets, visiting the inner courtyards of its houses, meeting its inhabitants and enjoying the best multimedia art created today in Israel and around the world. Jump with this psychedelic fun-rock band that features a projector on stage that will intensify your spiritual experience. Redefining video art, the band combines live instruments with computer animations live on stage. Nowadays society changes so rapidly it’s hard to stop and think. So how do we change and improve existing systems in times of social crisis? This performance will deal with the role of humanity in creating history and the impact the community has on the individual. Nitsan Bernshtein is a modern day gypsy. She likes to wander around the festival by herself or, at times, with a musician. She believes in intimate interactions between the artist and their audience, and she has plenty of surprises in her pockets. The New Music Department students will play computer generated music in digital duos. The shows are based on the Digital Studio and Synthesis classes. Come and meet the musicians of tomorrow! Soft, mesmerizing, and extremely powerful. Aviv “Sol Monk” Cohen, Shuzin, and Yonatan Albalak are joining forces and endowing us with a new electronic power trio that will get you hooked. The band will feature pioneer jazz singer and interdisciplinary artist Tzvia Bar Abrabanel in this unique performance.